Dental care has certainly changed over the years. I remember my dentist I went to when I was younger. It was in the end house next to a roundabout. It had a white door and the waiting room was like a big lounge with the actual dentist chair in what I always thought was the back kitchen! Despite popular belief, I actually have a very small mouth so spent a lot of time with that awful black plastic mask over my face being ‘put to sleep’ via ‘gas’ to have teeth yanked out. Going to sleep for the extraction was ok – waking up, was awful! Feeling groggy and nauseous for some hours after and trying to walk home (we didn’t have a car) with my mum instructing me to take deep breaths – I’m sure I actually hyper-ventilated several times. As a result of all these visits I only have 24 teeth left – and with one back wisdom tooth now removed there is more space within my mouth than teeth at the moment! I rarely rant when blogging, but I feel today might be one of those rare moments that I do. There was never the healthy eating campaign when I was growing up. Stood with my piece of bread to dip it in the lamb dripping was a common occurrence and sweets were a treat that we all loved and craved. Sugar was everywhere and a consequence of this was that so were the fillings. Although I don’t have many teeth, I think I have even fewer which do not have some sort of metal glistening from them. Today’s children boast about filling free mouths, to be honest I’m just grateful to still have teeth! Although injections are all the craze now, when I visited the dentist I was put under the influence of something called RA? I’m not sure if this was the right name for it, but looking back it was appears to have been some sort of LSD breathable drug! My memories of this are horrible, mind bending scenarios which caused reoccurring nightmares for days after. I was so pleased when I actually managed to have the courage to ask for injections instead. Over the years I developed a mortal fear of dentists – nearly passing out just sat in the waiting room. My current dentist has been great with me and I thank him every visit for being so tolerable of my ‘condition’. I was well on the mend put a recent nasty root canal has shot me back a long way. This was with a different dentist and I think, in future, I will suffer the pain and sleepless nights rather than going to the emergency dentist! I rarely rant when blogging, but I feel today might be one of those rare moments that I do. What on earth has happened to toothpaste! I understand that we have to clean our teeth and that flossing and dental brushes and mouthwash are all now considered almost essential elements of tooth care, but why so many toothpastes! As I was growing up, I think I can probably remember three – the old person’s one (pure white and in a boring tube), the fresh breath one (clear blue and tangy! ), the three in one (think this was called SR – three stripes each doing its own thing) and final, and this was definitely the strangest, the powder one? Yes that’s right – there was definitely a powder toothpaste. I remember my dad used it. It was in a tin, you took the lid off and dabbed your wet toothbrush into it and brushed. I’m sure it probably removed tartar since it was like brushing with grit or the old fashion metal scouring pads! Looking at the shelf nowadays there is a mass of toothpastes all claiming wonderful effects – whitening, gentle whitening, extra whitening, sensitive and caring whitening, whitening with fresh breath and even fresh breath with anti fungal additives for your tongue…maybe got carried away with that last one. 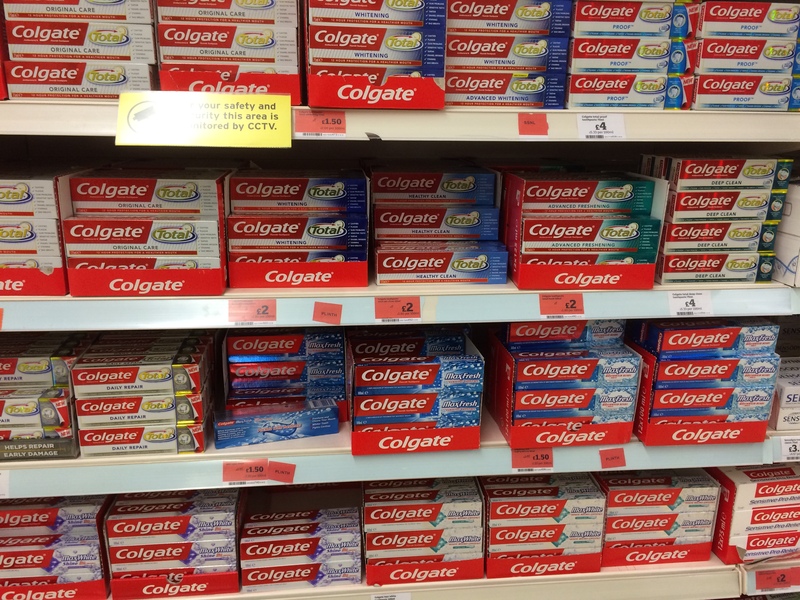 I’m all in favour of choice, but do we really need all these different types of toothpaste? Each promising wonderful results within their ten day challenges. 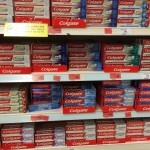 My current shopping tactic for toothpaste? Look for the cheapest or the one on offer or, failing that, close my eyes and just grab one. For me, I just want a toothpaste which cleans my teeth, doesn’t burn the inside of my mouth out and leaves my breath fresh so that people don’t shy away when I am breathing next to them. You can keep up to date with my content by following me on Twitch, Twitter and Facebook. If you are interested in joining or playing Minecraft, then you can join the server and website here. Of course any subscribers to my YouTube channel are always appreciated. Keep up with that dental care and I’ll catch you all later.